Forgiveness means letting go of the hope for a better past. you release your anger and grant forgiveness. 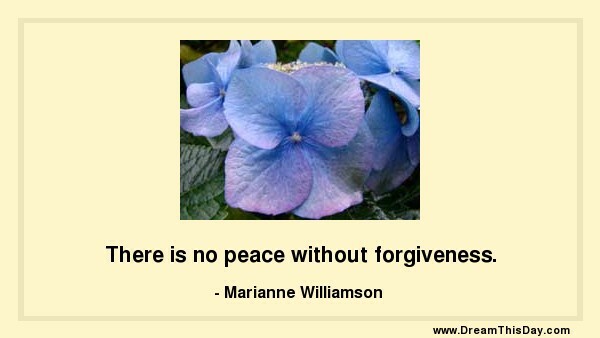 Forgiving is your gift to yourself - a great gift - the gift of happiness. This is so very hard to do forgive from the heart when someone has done and said very bad things to you and done it on purpose intentionally to cause you hurt and pain, but I do understand if you can try to forgive they have no power over you..it releases you from it.. something I struggle with quite a lot in my life,I suppose some could try to forgive but I don't think you'd ever forget..bad words or things..it takes a very courageous kind of person with a lot of inner strength to forgive..but not forgiving someome maybe..really increases your suffering and pain..
Julia, Thank you for your kind words. Hello Jonathan. I've been receiving your daily email quotes for a while now. I found your site by briefly looking at the forum on Inspiration Peak. I need to thank you. I needed this today. Tracee B.